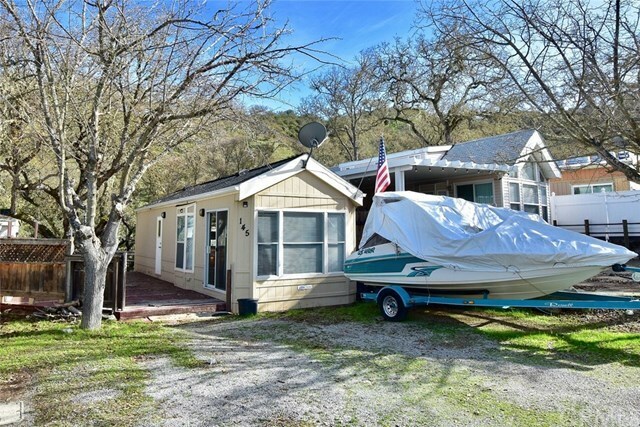 Year-round lake retreat on one of the most desirable cul-de-sacs in the Heritage Ranch RV neighborhood. Own the lot AND the 1996 Cavco park model RV. Features include 1 bedroom with mirrored closet doors, 1 full bath, living room, full kitchen with electric range, lots of storage and built-ins throughout, ceiling fans, built-in stereo system, whole-house AC and heating. Vaulted ceilings and lots of windows make the indoor space bright and comfortable. The floor throughout has recently been upgraded with beautiful laminate wood. Outside, the unit has new roofing and rain gutters. There is large double-door shed and an expansive wood deck along the side and back overlooking the wooded greenbelt, perfect for entertaining, BBQ’s, and well lit for evening enjoyment. The RV neighborhood also has additional bathrooms with showers, laundry facilities. Financing available to qualified buyers.